Make a Garment a Month Challenge: June's MAGAM Project . . . uuwww so excited! My sewing sisters, divas. I'm gonna really need you to rally around me this month. This will be a challenge extraordinaire for me. Get this . . . . 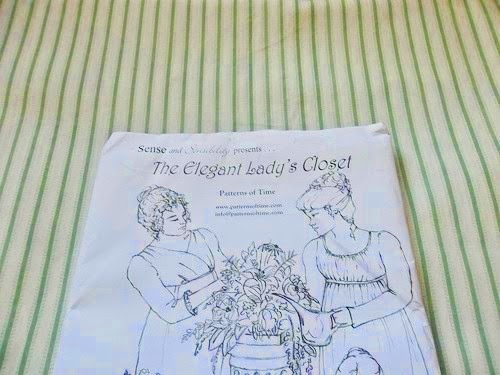 I am going to hand sew a Regency day dress from a thrifted bed sheet. Oh, and get this, I thoroughly expect to wear the thing . . .yup at home, out and about, wherever I choose to! You are courageous to hand sew a dress. I look forward to seeing it! Wish I could take the "courageious" credit, but alas, I am visiting awaiting the birth of my granddaughter . . . thus my sewing machine "Tabitha" is at home. I didn;t want to bow out of June's MAGAM so decided to do something I've been wanting to do for about a year. That is, make a garment entirely hand sewn. This is the month! Thanks for looking and especially for commenting.